Our Annual Inventory Clearance SALE is on! 50% off EVERYTHING! We hope everyone had a great holiday! And before we wish you a Happy New Year it's time to sneak in our Annual Inventory Clearance SALE! Everything is 50% off at both of our shops, our Etsy shop and our website. The sale runs from Christmas through New Year's Eve. Don't miss this huge once-a-year sale! I like to call it our "buy it, so I don't have to count it" sale. Essentially, everything is half off to reduce our inventory stock before we have to do our end-of-year count for taxes. The sale ends when the new year arrives! 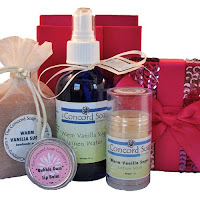 Black Friday - Cyber Monday SALE from Concord Soap Company! Happy Thanksgiving....now let the shopping begin!! We are having an awesome SALE from Black Friday (11/27) through Cyber Monday (11/30). Start your holiday shopping now & don't miss these great deals! All Lip Balm on sale for $2 each! All Bath Salt Tubes on sale for $1.75 each! All Lotion Sticks on sale for $5 each! 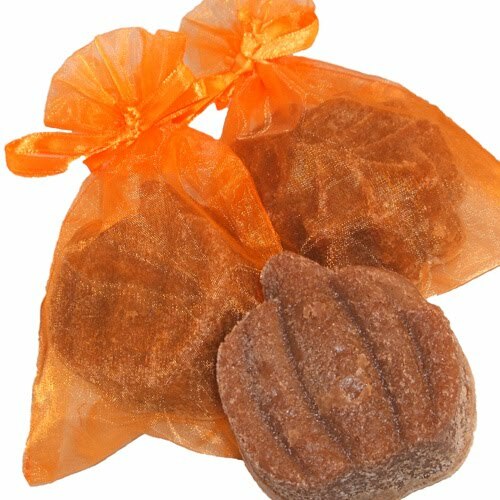 All Sachets on sale for $1.50 each! These are all great stocking stuffers! Our newest creations for FALL! Pumpkin Spice Soap in a sweet little pumpkin shape! Gingerbread Soap in an oak leaf shape! As promised in my last blog post, here are some shots of our Custom Wedding Favors! These little cuties are our hand dipped soap petals lovingly packaged in a sweet little tin. It is finished with a ribbon and custom label. 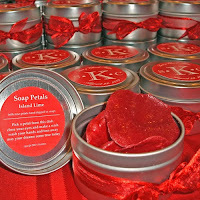 They are silk rose petals that are hand-dipped into scented melt & pour soap. How do they work? Simply put the petals next to your sink where you would normally put your guest soap. Take one petal and wash your hands with it as normal. Discard petal when done. (If you will be using these petals yourself, you can continue using the same petal for a number of washings. You can even upcycle the petals once all the soap is used, as potpourri.) The soap petals and matching ribbon are available in any color. You may choose any of our current fragrances for this custom order. The top label will be customized to your needs. They can be made with Thank You, Merry Christmas (shown below) or any other message on the top label. Please be aware that this is a CUSTOM order! It will take 2-3 weeks to complete this type of order after all color layout decisions have been made. 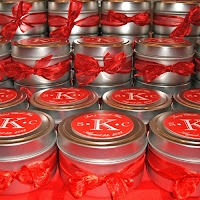 We offer these tins in an assortment of quantities to fit your needs. There are price breaks for ordering higher quantities. Arrrgh...it's been awhile since my last blog post. Where have we been, you ask?! Hard at work, of course! We had a large wedding order to fill. 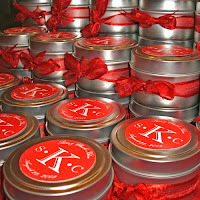 (I'll post pix in a few days) It was 250 tins of soap petals with custom labels. They turned out awesome! (I know, pix would be nice...they're coming, I swear!) Then we had a wholesale order to fill. And, of course, I had to make some things to fill it. Plus, this is the time of year when production starts gearing up for the holidays! I've been making lots & lots of stuff to restock my poor, depleted inventory. I am hoping to be able to make a few NEW items for the holiday season, too. I have so many ideas! That's all for now...hopefully I'll be back soon to post some pix of the wedding favors! We've just joined Trunkt today. We are working feverishly to update our account & get items listed. There will be information for retail & wholesale accounts! Please bear with us until we get everything up & running! But....if you can't stand the wait....you can take a peek below! Well...life has been particularly crazy these days. Some *good* crazy & some *terrible* crazy! First, the bad news...we've had another death in the family. A dear, sweet cousin that has gone on our last 6 vacations with us died suddenly from a heart attack. We were supposed to leave in a few days for our 7th trip with him. We are all devastated. He will be missed more than I can express right now. The other crazy part of our lives are all the typical summer stuff...softball games, karate, library programs, summer house projects, vacation and all the gazillion things we try to accomplish each summer! PLUS both of my sisters are getting married! This excitement adds even more to the summer mayhem: wedding showers, bachelorette parties, shower favor making, wedding favor making, invitation stuffing, dress fittings, dress alterations, shoe shopping (or I should say shoe SEARCHING) and everything else I am forgetting at the moment!!! Yikes...now that I typed it out I am really scared! Congratulations to Julie C. from Lyndhurst, Ohio! Julie won the first Cleveland Handmade giveaway! Yippee! She won my Ocean Rain Sequin Gift Box Set! I shipped it out yesterday, Julie....the soap is in the mail! The newest giveaway is posted at Cleveland Handmade. 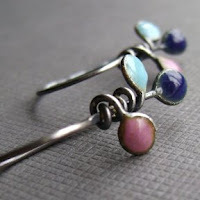 It is a gorgeous pair of earrings from the very talented, smashing. Hop over to Cleveland Handmade & enter to win! As a thank you for all our wonderful customers/supporters, the Etsy Cleveland team is starting a special giveaway series. This is a great opportunity to find some wonderful shops new-to-you or get reaquainted with some faves. Go to Cleveland Handmade and simply follow the directions to win the giveaway item. Basically, you take a look at the featured shop and pick a favorite item. Then pick a fave from one of the other team members. Post both of these on the Cleveland Handmade website.You have a chance to win an Ocean Rain Sequin Gift Box Set that I donated. This giveaway is running until Wednesday, May 20 at noon EST. Take a look & GOOD LUCK! Happy Birthday Grandpa - I Miss You! Today, May 14th, would have been Grandpa's birthday. It's been about six months since we lost him and I am still stuggling with the grief. We were very close. I was the first grandchild and he often called me "the firstest & the bestest." I took a few quick pictures (of framed photos) this morning, so forgive me for how blurry they are...but then again, that's how I am seeing everything today...blurry...through my tears. Grandpa was a very successful man. He was a milkman...how cute is that? He started his own dairy and then moved into convenience stores. The biz grew to over 100 stores across NE Ohio. He was a shrewd business man that wasn't afraid to try something new. He had a very loud booming voice that he wasn't afraid to use, either. But, us grandkids knew he was an old softie! I remember how he had the DJ play a special song that his friend had recorded at my wedding. The entire time we were dancing, he was singing loud & proud! My husband always talks about the time when Grandpa was in his sixties doing cartwheels around their yard one day! He had a great sense of humor. He loved calling all of us by the nicknames he had given us. My nickname was Mosis, not Moses, MO-sis (like sister). I think maybe it was how I said my name, Melissa, when I was little. But he was the only one that ever called me that...and I miss hearing it! I am grateful that my daughter was able to know him. They had a special relationship as well. She was his Dolly. That was his nickname for her. She only knew him while he was sick. His health started declining right after my wedding. But, Ilana, could always make Grandpa smile. She loved going with him & Grandma to Bob Evans for dinner. Grandpa had a thing for Bob Evans and him & Grandma ate there almost EVERY night for years! Phew, that's a lot of Bob Evans! I don't really blog here about personal stuff, but felt I needed to today. Besides, Grandpa was one of my biggest supporters. He loved my handmade soap & told anyone who would listen how great it is! I like to think that I got my strong work ethic from him. And as my soap biz has really become successful this past year, I can't help but think it is him watching over me. Happy Birthday Grandpa...I miss you! 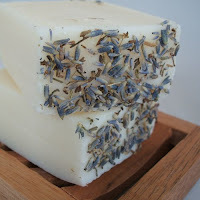 I entered my Lilacs in Bloom soap in this month's challenge for Cleveland Handmade. There are some really great entries! There are choices of jewelry, fine art, clothing, accessories...and SOAP, of course! Click here to vote! And after you vote...check out the shops of these great Cleveland area artists! Our weather isn't always the best here in Ohio, so we have lots of "indoor" time to perfect our craft! I added a few of my gift sets to my Etsy shop. I have a few different ones listed. Most of them are all set and ready to ship! A few of them are able to be customized into whatever fragrances you would like. The sequin gift boxes are sooooo awesome! When I saw them for sale, I scooped them up before anyone else could even think of taking them! Today is ETSY day! Yippee! Did you ETSY today? 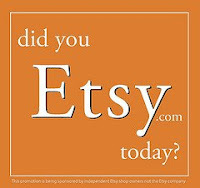 Etsy is an online marketplace for buying and selling all things handmade. You'll find a creative group of independent artists and designers and the very best in handmade goods, craft supplies and vintage. It's an excellent place to find one of a kind items, to give as gifts - or keep for yourself! Since you're buying directly from artists on Etsy, you have the unique opportunity to form personal connections with the people who create your treasures. Signing up is free and easy! Just click here! I have bought lots of great items on Etsy. Some for myself and some as gifts for my family & friends. Being a handmade soapmaker, I LOVE being able to support other handmade artisans! You can search for local artists in your area, as well. Take a couple minutes & explore Etsy today...you won't be disappointed! My soap and body butter have been blogged about! How nice! It always feels like a little hug when you find out about these things! First off is a mention on my Etsy soap team...SAFE. SAFE stands for Soap Artisans Friends of Etsy. It's a wonderful collection of great soapmakers & bath and body makers. There are all kinds of soapmakers here, cold process (like me), melt-and-pour, hot process & more. Their blog mention was about my body butters. My Almond Amaretto Body Butter to be exact! Check it out! Secondly, a fellow member of the Cleveland Etsy Street Team mentioned my Sad, Little Soap Bars on her blog. (I think it was the cute baby picture that got her attention!) She really wrote a nice little article about those bars! Check out Leah's blog here! 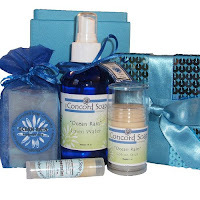 Lastly, I found my Ocean Rain soap on A Chase After Wind blog. The soap mentioned fit with the theme due to recent weather! Funny...ocean rain, huh? Must be a LOT of rain! Check out this blog! New Soap Listings! Fully cured & ready to ship! 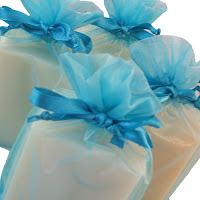 Ok, ok...I FINALLY listed my newest soap fragrances! First of all, I hate taking photos. I am my own worst critic! This is the main reason it took me so long to get them listed in my Etsy shop. Ahhh...procrastination! They have been ready for a while now. In fact, I started selling them at my spring craft shows. Everyone seemed to really enjoy all the new scents! So, like I said, I finally have the photos taken & the listings made. So, check them out & let me know what you think! Meet Almond Amaretto! This scent is sooooo awesome! 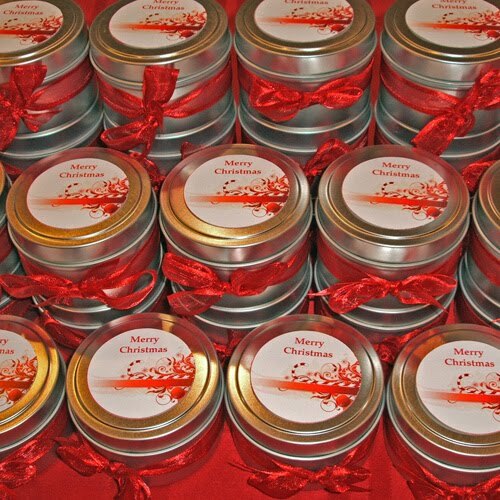 (confession: I made this scent for myself) This one was the big winner at the craft shows! This newbie is Eucalyptus & Spearmint! This was a customer requested scent. Yep...I listen and I give the people what they want! Introducing...Fresh & Clean! This scent smells clean!? I think it is reminding me of a fabric softener or something like that. I don't know...but it smells fresh, clean & lemon-y! And this little beauty is Secret Garden! This is for all you floral lovers! It's a fabulous floral scent that isn't overpowering. I am in the process of mailing out a postcard with a special offer to my customers. If you would like to receive this mailer, convo me at my Etsy shop, http://www.concordsoap.etsy.com/ or email me via my website, http://www.concordsoapcompany.com/ and I will get one out to you. Please include your name & mailing address. You can include your email address if you would like. This is a snail mail offer, but I do send out email offer as well. And I'm not telling what the offer is, but it's a good one! Hey all! I've been plagued with computer problems for the last two weeks...ugh! No, it wasn't that conficker thingy...but it was due to a trojan horse. Anyway, I needed to get a new hard drive and reload all the software, etc. etc. Luckily, I had my external back-up drive working so I didn't lose too much data. I probably lost about a month and a half of data entry. Oh well, it could be a lot worse! My two spring craft shows are over. They went pretty well. One better than the other. I definitely saw a decline in the attendance numbers compared to previous years. Was it due to the economy? dunno. Spring shows are always kinda iffy...ya never know what you will get! Now that the craft shows are done and the computer is up and running, I really really need to get the photos taken of the new soap scents! Let's hope this "spring" craft show is better than last year...it got cancelled due to a huge SNOW storm! How's that for irony! This show is called Springtime in the Country Craft Boutique. It is located at St. Gabriel's School. The show runs from 6pm-9:30pm on Friday, March 27th and 9am-4pm on Saturday, March 28th. My table location is in the Multi-Purpose Room, table #77. The address for this show is 9935 Johnnycake Ridge Road Concord Twp, Ohio. I've been doing this show for years & years, but this will be a new table location for me. I have a few new scents to share! I hope to see you there, if you are in the area...stop by & say hi! First off...Happy Friday the 13th! Mwahahahahaha! I will be the Spring Craft & Trade Show at St. Paschal Baylon Church tomorrow. The show runs from 9am - 3pm on March 14th. My table location is in the Parish Life Center room. The address for this show is 5384 Wilson Mills Road Highland Heights, Ohio. I've been doing this show for years & years. There are some really great vendors here. My truck is almost completely loaded up...just a few last minute gift baskets to make up & I'll be ready. I hope to see you there, if you are in the area. Stop by & say hi! Groovy, Man! 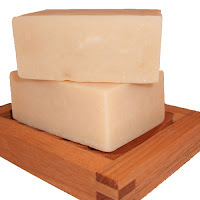 It's baaaaaack...Patchouli Soap! There are a bunch of patchouli lovers out there that begged & begged for this one. This is the classic scent of the 60s, you know it, you love it. Perfect for those psychedelic flashbacks, man! 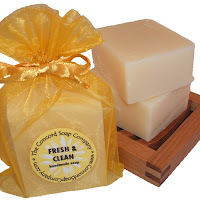 Our soap is handmade in small batches to focus on quality! We use the cold process method and superior ingredients. Each is hand cut and allowed to cure for approximately 4-6 weeks. Our Patchouli soap is packaged in a gold organza bag. 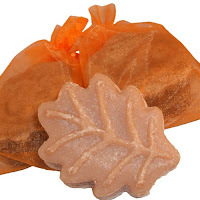 Since it will retain some of the soap fragrance, we encourage you to reuse the organza bag for something wonderful! No animal fats, artificial colorants or preservatives in any of our products! Please keep your soap in a well drained dish to keep your soap around as long as possible! 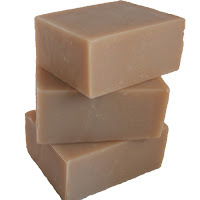 If handmade soap is allowed to sit in water for too long it will become mushy and not last very long. Now we don't want that, do we? New lip balm flavors & the return of a sachet! Fields of Lavender Sachets are back!! Yeah!! They have been missing from my shop for quite awhile. I was waiting to get a new photo light box tent to take some new pix. Since I am in Ohio & the winter lasts FOREVER (especially this year) I thought it would be a good idea to get one. Now I can take some decent *indoor* shots! The lavender sachets are back up on Etsy at http://www.etsy.com/view_listing.php?listing_id=21713848. Both of my sisters are getting married this year. One in August in Columbus, Ohio & the other in November in Chicago. Needless to say, my family is a little bonkers lately! Oh, plus we're all going to my cousin's wedding in Tuscon, AZ shortly. That's a lot of weddings for one year! My daughter & I are going to the bridal shop today to get fitted & pick our choices for the maid of honor/jr bridesmaid dresses. She is almost 9 & is over-the-top excited for such a "big girl" dress! 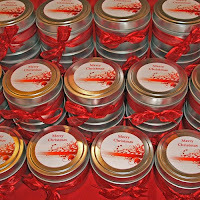 I am hoping to get back from the bridal shop early enough to get some new lip balm flavors listed in the Etsy shop today. We'll see how it works out! I will post when I get the new lip balm listed. And the soap that is currently curing should be getting close to being ready. I will check on that later today, too! I'm having a Saturday Night Special in my Etsy shop tonight! 25% off entire order (before shipping)! Put “SNS 25% off” in notes to seller. I will refund ASAP or you can wait for a new PayPal invoice if you prefer. Sale is valid from 5pm EST 2/28/09 to 6am EST 2/29/09. I was working on a new product this weekend! I'm super excited about it! I will probably need a few weeks to get it all squared away, but I will post when it is ready. I am looking for your opinions as to what our next new product should be. Vote (in the right column) for your 1st choice! 30% off EVERYTHING in my Etsy shop! How’s that for a good deal? 30% off all soap, body butter, lotion sticks, powder, linen water, lip balm, sachets, refresher oils, soap leaves & even destash! 30% off entire order (before shipping)! Put “SNS 30% off” in notes to seller. . I will refund ASAP or you can wait for a new PayPal invoice if you prefer. Sale is valid from 5pm EST 2/21/09 to 6am EST 2/22/09. Thanks so much! Happy *Saturday Night* Shopping! Hi there! Welcome to my brand spankin' new blog...bear with me while I figure this all out! I recently started selling my handmade soap, bath & body care products on Etsy in Sept 2008. http://www.ConcordSoap.etsy.com/ If you haven't checked out Etsy.com, you should! Etsy is a marketplace for handmade goods & is completely addictive! They showcase the most wonderful handmade items you could ever imagine. I've also been selling my goods on my own website, http://www.concordsoapcompany.com/, since 2002 or so. I sell locally in Northeast Ohio at craft shows and such.